Balzac, as we know, had a view of women that would land him in big trouble with contemporary feminists. His female characters were all either saints or sinners, and while some of them might have been cunning or sly, few of them were capable or competent at anything. So it would come as a great surprise to Balzac to know about the role that women have played in bringing his oeuvre to the world. Ellen Marriage (1865 – 1946) was an English translator fluent in French. She started translating La Comedie Humaine when her neighbour and critic, A.R. Waller suggested it: he pitched a proposal to the English publishers J.M. Dent and Sons that they should publish the first complete edition. She completed most of the eventual 40 volumes, except for five omitted because they were too rude (!) and 13 done by Clara Bell and one by Rachel Scott. The racier ones that made it past this publisher’s self-censorship were published not under Ellen Marriage’s name, but under the male pseudonym James Waring! Clara Bell (1835–1927). Also an English translator, Bell was fluent in no less than eight languages: French, German, Danish, Dutch, Italian, Norwegian, Russian, and Spanish. Her French translations include Maupassant as well as Balzac. Rachel Scott (1874–1905): *sigh* There is no acknowledgement of Rachel Scott at Wikipedia. But (wonders of Twitter!) thanks to @TranslatedWorld, we know that Rachel Scott was an active educational reformer & feminist, and wife of CP Scott, editor of Manchester Guardian. That led to checking her husband’s page at Wikipedia, where it says that Rachel Cook was one of the first undergraduates of the College for Women, Hitchin (later Girton College, Cambridge). And you can find her entry at Oxford here which tells us that she translated Une fille d’Ève (A Daughter of Eve) and Mémoires de deux jeunes mariées (Memoirs of Two Young Married Women). Katherine Prescott Wormeley (1830-1908). She was born in the UK but migrated to the US where she served as a nurse in the Civil War. She became one of the best known translators of her time, and translated the complete works of Balzac (40 vols., 1883-97). Project Gutenberg is a digital library and archive of cultural works, free for anyone to download as an e-text. The digitization of works in the public domain (i.e. out of copyright) is done entirely by volunteers. 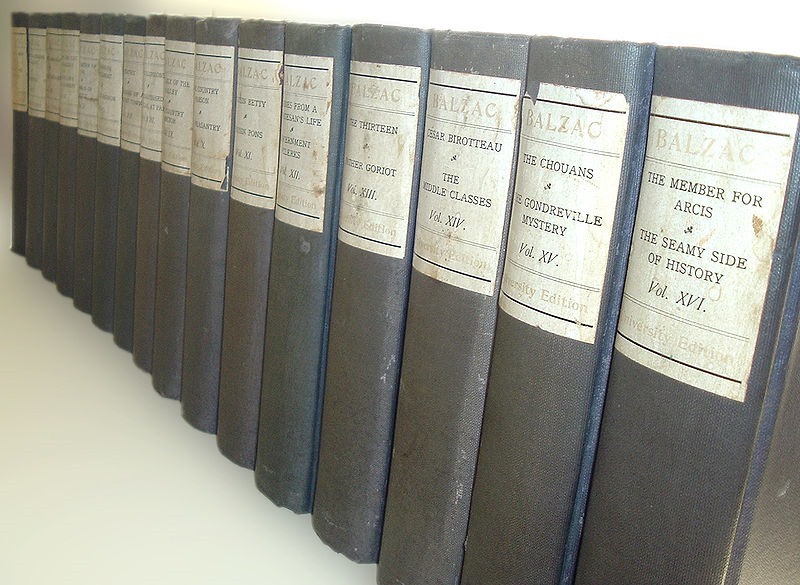 And Balzac’s works are there due to the combined efforts of New Zealander John Bickers (who has also digitized an extraordinary number of other authors and is now active at Project Gutenberg Australia) and our very own Dagny a.k.a Madame Vauquer from the Vauquer Boarding House and co-conspirator for this blog! When they started this project, there was only one story available: The Duchesse de Langeais. Between them, Dagny and John typed the remaining entire La Comedie Humaine. John, in New Zealand, had the Katherine Prescott Wormeley edition, and Dagny in the US. had the Dent edition edited by George Saintsbury. As each typed a story, the other proofread and corrected it. One of the guys at PG once held an informal proofreading contest. He gave the same text to everyone who wanted to participate and we sent a corrected text to him. John and I came in first and second. After we had each submitted our corrected text, we asked if we could send an extra entry with our cross-proofing and it was near perfect. John and I did well proofing each other’s work because we tend to make different types of errors. The task took eighteen months, and was finished in February 1999, in time for the bicentennial of Balzac’s birthday in May, 1999. So next time you come across one of Balzac’s saints or sinners, remember these women (and John!) and how between them, they have kept his work alive for us to enjoy in the 21st century! What about translations that are more recent? I seem to remember seeing a few of Balzac’s works offered on Amazon, by a translator whose name I forget, but who translated them at least after WWII. Yes, almost all of the major works have new translations, but to my knowledge there is no modern complete set. At least one of these modern translators is a woman, but men seem to be in the majority.